This evening I went to see Creation – a film about Charles Darwin. The film was absorbing – somewhat over-emotional, perhaps – focusing heavily on the double trauma Darwin suffered as a result of his scientific convictions and the death of his daughter – and the rift they caused between him and his intensely religious wife. But it also reminded me (if this doesn’t sound too grand) of my own slightly unusual and privileged upbringing. My parents were both agnostic academics – one a botanist, the other principally a zoologist. I grew up – without really noticing it – in a scientifically charged background – no stone went unturned, no question un-answered, no fact un-checked or undiscussed. In retrospect, time was spent directly or indirectly studying and observing every living thing around us. It wasn’t regarded as even remotely odd that my older brother kept big hairy spiders in large sweet jars next to his bed and caught flies with which to feed them, or that he ‘boiled’ small dead mammals in order to then reconstruct and study their skeletons (he went on, incidentally, to become a Professor of Oral Physiology). Weekend walks and picnics frequently involved pond-dipping and specimen-collecting – and I clearly remember, at around the age of nine, watching totally fascinated and without turning a hair while my mother dissected a rat in the kitchen (as preparation for a class, not dinner). Another memory involves about 30 huge black horse leeches (collected for another class) that escaped from a lidded jar in the kitchen during the night and were never seen again. As a family we didn’t do ‘squeamish’. Most importantly, as far as my life turned out, ‘play’ time in our tiny garden increasingly revolved around a garden pond and bog garden, where the natural world was observed daily, just as a matter or course, in minute detail. Doubtless as result of this, almost the first thing I have thought of putting in to the various gardens I have made has been a simple pond. 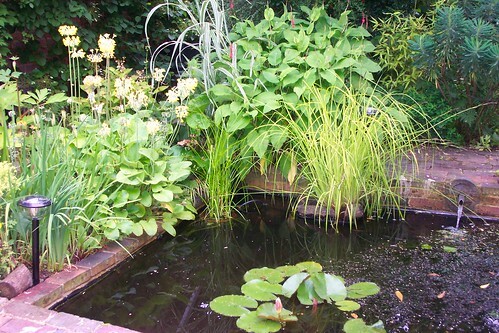 And as everyone who has ever had one knows, every garden pond is what is now known as a ‘wildlife pond’ – an important haven for increasingly beleaguered common frogs and newts. Now, I know there’s a lot of controversy about children’s’ safety where water in gardens are concerned – the first pond I made was when my son was five years old and was a raised affair with safe-height brick walls. Nevertheless, in a London garden that was far too small for football, a pond became an important focus, and was instrumental in introducing him to the entire natural world. I remember – and he too remembers – sultry summer evenings ‘pond-watching’ when he was slightly older, in a different garden. Rugs were routinely put down on the dewy grass well after what would have been considered bedtime and we spent hours with our noses inches from the water observing tiny fish, frogs, leeches, water fleas and dragonfly larvae in its depths, brilliantly spot-lit in the beams of our torches. It was a whole, real world of nature right there in his back garden. I spoke on the phone to my now-adult son (who, incidentally, went on to study biochemistry and from there to a career in science communications) about his reaction to Creation, which he had also recently seen. Like me, funnily enough, the film had reminded him of his background and upbringing – and of the influence his remarkable grandparents had had on him. I reminded him (with an involuntary shudder) that I had tried to do my part too – that I had even hidden from him my completely irrational fear of insects – and of dragonflies in particular – in order that he should find them fascinating. Which he did, and still does. But the purpose of this post is to simply say that the one of the best things you can do for your children once they get to a certain age is put a pond in your garden, wait for it to become the teeming hub of the place – which it rapidly does, without any effort from us – and, hopefully, it will ignite their interest in ecology and natural history. And also – go and see Creation. It’s an imperfect but thought-provoking little film that brought home to me just how much we take Darwin’s theories for granted (even though most of us (me included) have only sketchy knowledge of them) and how completely – and extraordinarily recently, really – he and his colleagues overturned the then-accepted way we looked at the world. This entry was posted on Wednesday, September 30th, 2009 at 7:33 pm and is filed under Musings. You can follow any responses to this entry through the RSS 2.0 feed. You can leave a response, or trackback from your own site. What a very interesting post. I remember saying to a mum when our children were small that we didn’t have a sand pit in our garden she replied that with a garden like mine the children didn’t need a sand pit because there was so much else to do. 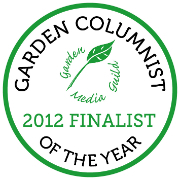 Whether it was nature or nurture they have both grown up with my love of gardening and wildlife. Some years ago we visited Down House the home of Charles Darwin and I would throughly recommend a visit to the house and gardens, it was very interesting and enjoyable. I was at your talk at Sotheby’s last night and thoroughly enjoyed it, you are a very brave lady and have obviously just got on with your life. 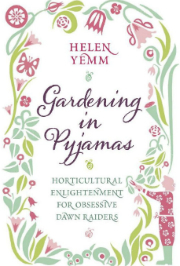 I think having gardening as an all-absorbing love makes up for most things, one’s mind just rootles off in all directions when weeding or dead-heading, it’s lovely. I also have seen Creation, I particularly enjoyed the acting of Paul Bettany, I last saw him as a very creepy villian in The Da Vinci Codes, and the little girl who played Annie was brilliant, I thought. Again, thank you for last night, also your slides were brilliant too!! Pitch perfect post. You really are good at this blogging lark. Curiosity is one of the greatest gift a parent can give a child. My father was curious until his last day. I think curiosity is what gives life texture. I enjoy someone sharing their curiosity and learning path. I’ve worked with kids who live in poverty. If thier mind stays curious, they can think for themselves and choose a different path for themselves. Beautiful post. It brought upon many reflections.